It's a testament to Geoff Johns' writing, assisted by Adam Beechen, that he's able to squeeze so much characterization into what's essentially just one big fight scene in Teen Titans: Titans East. At the same time, it's pretty inescapable that Titans East really is just one big fight scene, and for that reason Titans East is not nearly as strong as other Teen Titans trades past. Where Titans East works is that it rises above being a story just about the Titans battling their dark opposites. Miss Martian fighting a fire-throwing villain is simple enough, but Johns adds an extra hint that the two have a conflict stretching out into the future. That Kid Devil fights the saintly Kid Crusader is also pretty straightforward, but it's complicated by the tragic elements Johns adds to Kid Devil's origin in this trade. Indeed, Kid Devil steals the show in this book. We learn he's cursed by Neron, estranged from Blue Devil, and fated to be condemned to Hell as soon as he turns twenty. With this last facet, Johns reflects some of the themes of Teen Titans back on itself; whereas the other heroes are often in a hurry to grow up, Kid Devil is the one who wants to stay young forever. Devil becomes an interesting mix of the carefree Changeling and the burdened-with-a-secret Superboy, and he fits right in with Titans filling these roles. In the absence of Superboy and Kid Flash, the Teen Titans don't at times feel like the Teen Titans anymore; it becomes something of a great relief, to that end, to have Jericho alive again. One of the themes of Titans East is that of family, and having Joey back around makes the Titans feel more familial. The character bridges the gap not just between the new young Titans and the older originals, but also between Robin and Wonder Girl and new member Ravager, and his presence gives me faith that the post-One Year Later Titans can work. Of course, Johns quickly complicates this, too, by having Jericho take on the body of Match, the Bizarro clone of Superboy. The obvious drama ensues, with Wonder Girl unable to stand the sight of her undead former boyfriend. The situation works incredibly well in theory, though not quite in fact; Johns and Beechen write Wonder Girl increasingly melodramatic and whiny, in a way that I imagine is off-putting to many readers. We expect Wonder Girl to mourn Superboy for a while, but the writers should watch that they don't make Wonder Girl a one-note character in the process. The trade includes a final chapter that picks up from the first issue of Countdown to Final Crisis. Titans, of course, has to acknowledge the death that takes place in that issue, though the crossover doesn't add much. The dialogue of the "shadowy figure" is wildly off from the same character in Countdown, and the timeline of Donna Troy and Red Hood Jason Todd doesn't quite mesh. I take these crossovers with a grain of salt, enjoying them warts and all, but I would hardly call Titans East an integral Countdown crossover. It's important that all the subtext in Titans East is so rich, because the foreground isn't all that exciting. There's nothing shocking, really, in the fights that the Titans have with their counterparts; early on, Jericho gets in a good shot at Deathstroke the Terminator reminiscent of when Deathstroke stabbed Jericho the same, though one is never made to fear that either Jericho or Deathstroke might actually be in trouble. The glamour that Deathstroke had upon his revitalization in Identity Crisis is rapidly fading from overuse; that he attacks the Titans with Titans East for the purpose--once again--of secretly benefitting his estranged family, is starting to feel old hat. The Titans, it would seem, fight more dark duplicates in the next trade, this time from the future. My hope is that we'll see a little more talking and a little less fighting, or at least a plot as rich in the foreground as in the background. On now to pick up with two of Collected Editions' favorite series, Checkmate and Outsiders, in Checkout! that he attacks the Titans with Titans East for the purpose--once again--of secretly benefitting his estranged family, is starting to feel old hat. I actually found that to be the only interesting part of the arc (though I must admit, I only flipped through most of it). It was one of the few glimpses I've seen in years of Deathstroke as Marv Wolfman wrote him, rather than the one-note "I'm evil. I like killing people. I'd laugh maniacally, except that I'm too intense to do that." Titans East does strike me as more of a flip-through trade than a must read. As for Deathstroke, I agree that this is a more multi-layered portrayal of him, but it seems like Deathstroke's motivation under Geoff Johns is always "pretend to be evil for my family," so much so that when Deathstroke's "secret motivation" is revealed, it's kind of a let-down. No indeed. 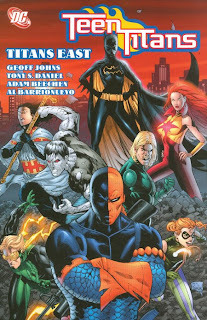 You're talking about the conclusion of Titans Hunt, and I would *love* to see that collected.